James Howard Kunstler spent the day in Tacoma yesterday and I got see some of it. For the sake of regular Tacoma Urbanist readers, I splurged last night and tonight and bought a seat at James Kunstler's "Captains Table" at Pacific Grill. Here, Kunstler reviews the plans for the Roberson condominium with Blaine Johnson, the developer looking on. No doubt the Roberson is one of the best designed new buildings in Tacoma. I was glad Kunstler didn't have to look at the plans for the Multi Care Steam plant. I had the New York Steak, a mid grade cut. Fairly expensive yes but it set me back less than a tank of gas. I didn't want to low brow it with Tacoma's much anticipated guest in town. James Kunstler and Whitney Rhodes at Pacific Grill. Sometimes my cell phone camera gets a good picture. I count this as one. Just before I squeezed off the shot, a heavenly beam of light entered the room blessing Kunstler's visit to Tacoma. Well known downtown personalities arrived. There was a quick sale of tickets on the last couple of days and Theater on the Square was almost full even though the Kunstler event had to compete with other activities downtown. From what I heard, there were around 240 people in attendance. Pretty impressive. The Kunstler event was certainly one of the high points of Paul's work with Local Life Tacoma. Kunstler was very engaging and spoke for around an hour and a half. The crowd seemed to be paying very close attention and seemed enthralled. He started out talking about peak oil issues and continued for quite a time and I was concerned that that was going to be the entire presentation. Then he switched into urban design mode. The best part for Tacoma is that he spent extra time going into the specific aspects of how active and successful public spaces are created as well as why dead result. Stating much of what Tacoma architect David Boe had stated earlier: public spaces need to have "active edges" to be successful like restaurants and/or businesses. He also emphasized that sufficiently high buildings need to define the space on the edge. 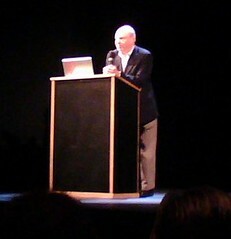 Overall, Kunstler was well received. At the end, he sold a slew of books from a line winding through the upper lobby and much of the crowd lingered. With the city paid Danish architect in town and several architects discussing proposed modifications to Tollefson Plaza, Kunstler discussed Tollefson Plaza head on. Kunstler stated that Tollefson Plaza is dead because all of its edges are dead. At least that's what I remember. There are many parts of Kunstler's presentation worth discussing. Perhaps more important than his presentation itself is the fact that a group of independent people and groups worked to bring Kunstler here and 240 people were willing to pay $18.00 a piece to see him discuss how to build a better city. What do you think? Did you get your $18.00 worth? by NineInchNachos on 4/24/2008 @ 9:03am any ETA on that TV Tacoma broadcast? It was lots of fun. People's eyes kinda glazed over for the oil stuff, but at least the seeds were planted and people can start chewing on it. Maybe it will help wake people up to how reliant we are on cheap energy. by Erik on 4/24/2008 @ 11:12am People's eyes kinda glazed over for the oil stuff, but at least the seeds were planted and people can start chewing on it. And what about buyers? Are you looking less from your car to save a few bucks? Or even rethinking where you might live to avoid driving and pricey gas bills? Could it be that $3.60 gas prices and $4.25 on diesel make the real estate axiom "drive till you can afford" no longer applicable? by thriceallamerican on 4/24/2008 @ 11:37am Make that $4.50 for diesel, at least at the Shell station by Wright Park last night. (And currently $4.75 for B99 biodiesel at APP.) Zoinks! by FunkomaVintage on 4/24/2008 @ 11:38am yeah, but then he went and had a STEAK ! at a fancy schmancy yup-piggie place......gosh it's HARD to be Good. by Erik on 4/24/2008 @ 12:14pm yeah, but then he went and had a STEAK ! at a fancy schmancy yup-piggie place......gosh it's HARD to be Good. Yes. I splurged. Usually, I am there for the happy hour which has items for around $5 which is cheaper than most of the "food" TGIF. Thank you for your email. At this time we have no definitive plans to air Mr.. Kunstler or agreements in place to stream the event. Those discussions are taking place but are very preliminary at this time. Our presence at the event last night was to document the presentation for internal use. by Erik on 4/24/2008 @ 12:48pm Our presence at the event last night was to document the presentation for internal use. A TV presentations for "internal use"? For a couple of reporters? by NineInchNachos on 4/24/2008 @ 12:55pm This looks like a job for PUPPET RE-ENACTMENT THEATER! by Heather on 4/24/2008 @ 4:20pm I'm so glad I have ya'll to turn to so I can laugh instead of cry. To answer Kevin's question to the attendees, I'm not sure if it was worth $18. But I'm really glad I didn't miss it. Just seeing the crowd was worth the cost, I think. I just watched the Danish architect's presentation through the city website and I wish more people, including myself, had attended. He didn't address Tollefson, but I thought his presentation was top-notch. So, did Paul Sparks speak out of turn about TV Tacoma or did they change their minds after they heard the presentation? Can't they bleep the expletives or something? And OMG, B99 is $4.75 now??? I don't drive much and I get 40 mpg, but $4.75 per gallon?! I've already been doubting my biodiesel choice because of the current global food crises. Been trying to bike and ride the bus. But honestly, it is awfully cold for biking and the bus is a pain in my freaking @$$. I have to walk a considerable distance to a bus stop, always seem to mis-calculate the walk time, or the bus is running early, and I miss the one I need and have to wait an average of 30-45 minutes in the cold wind for the next one. Then the stinkiest guy in Tacoma sits next to me and tells me his life story, ending by stating that my eyes are pretty. Which they are. But seriously, 99% of the population have pretty eyes. And don't even tell me that I need to move downtown if I want to be able to use transit efficiently. I'm only 4.5 miles from downtown. It should not be this difficult or take over an hour to get there by bus. Besides, I need the yard for my massive dog and my veggie garden. Right? Maybe I should start my own blog detailing the growing pains of transitioning from spoiled cognitive dissonance to responsible, tree-hugging, people-loving citizenship. RR, will you please say something else to make me laugh?? by thriceallamerican on 4/24/2008 @ 4:28pm Heather, I'm going to start promoting this more soon, but if you're interested getting into biodiesel homebrewing, I'm arranging a hands-on homebrewing class in Tacoma with BioLyle. As of yesterday(?) you can sign up via PayPal on his site! Maybe that could help alleviate some of your global-food-crisis guilt? by jenyum on 4/24/2008 @ 4:45pm I'm so glad I have ya'll to turn to so I can laugh instead of cry. Yes, please RR, puppet theatre but possibly not Kunstler-themed. by Erik on 4/24/2008 @ 4:46pm RR, will you please say something else to make me laugh?? Better yet, come to Frost Park at noon tomorrow and you might see RR draw something funny on the sidewalk. by NineInchNachos on 4/24/2008 @ 5:21pm um... how about: Nothing is funnier than unhappiness? Look the same reasons that people built Tacoma in the first place (pre-auto) are still here. Deep water port, Terminus to the trans continental railroad, fertile land, HydroPower, Dale Chihuly etc. Those things will be more important than ever. Could be worse, eh? You could be stuck in Las Vegas or LA. Also, Daniel Blue lost his car and he's still hangin' in there OK.
by andrew.austin on 4/25/2008 @ 10:00am It was a great event, great to see the strong turnout. Kunstler is apocolypic at times, but makes you think and is highly entertaining. Def. worth the 18$! by KevinFreitas on 4/25/2008 @ 10:29am ensie's got a great write-up of the evening on her site along with some great conversation about it. Not quite as rosy and Kunstler idolizing overall but I that's understandable since sometimes a dose of reality is needed in the face of this kind of hype. My thoughts: keep on keepin' on, Tacoma. We can and are doing this and making it happen. Thank you for your email. At this time we have no definitive plans or agreements in place to air Mr. Kunstler's Presentation or stream it to the internet. Those discussions are taking place but are very preliminary at this time. The announcement made at the event was premature. Our presence was primarily to document the presentation for internal use. by Heather on 4/25/2008 @ 10:37am I repent. Here is my confession. I missed another bus last night on my way to meet my fiance and a friend for dinner at the Crown Bar. So I crossed the street to The Clubhouse Grille. Went in the back door and drank a Baileys & Coffee. The bartender, Carmie, was wonderful. We chatted about recycling and Tacoma restaurants. I walked back to the stop, didn't miss the next bus. Sat by a lovely, private, young guy reading Isaac Asimov, who smelled like soap. Then, at the next stop, the ultra-patient, kind bus driver waited for an elderly couple. The gentleman could only walk at the pace of a snail. They had ridden to the Grocery Outlet, shopped, and walked back to the stop. Their transfers were expired, so they had to pay again. This means that it took them over an hour and a half to ride the bus and walk to the grocery and back. Next stop. Three, count them, three, separate elderly ladies with their groceries boarded. I AM SO BLESSED. I have no reason to complain. I sincerely apologize for my ranting yesterday. I was able to walk briskly, afford a hot drink, enjoy a lovely conversation, listen to my fiance's shuffle, window shop on Sixth Ave, enjoy a wonderful meal with great friends, and ride home in the comfort of my fiance's car. How many Hail Tacoma's do I need to recite? P.S. Thanks, Thrice, for bringing Lyle to Tacoma. I'll be there.